For Permanent Installation, designed and equipped with Smartload automatic load control system with intelligent software to maintain generator/s at a constant set load and absorb regenerative power. 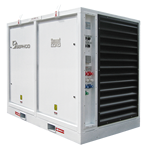 Large capacity resistive only load banks, sized from 3MW capacity, are designed for portable or fixed applications. The WA-CL series load banks are weatherproof construction, designed for harsh and tough environments for testing and commissioning of generators. Featuring rugged stainless steel immersion proof and vibration proof resistors, integrated switchgear with individual load circuit breakers. Controls are electronic touch type, models available with locally fitted controllers or remote data capture type. Designed for portable applications, the WAR series resistive and reactive load banks are weatherproof construction, designed for harsh and tough environments, for testing and commissioning of generators. Featuring rugged stainless steel immersion proof and vibration proof resistors, these advanced units boast high quality class F reactors and integrated switchgear with individual load circuit breakers. Control is portable, remote data capture with touch-type Key pad and PC interface. For Permanent Installation, designed to fit directly into generator enclosures, radiator mounted or into attenuated ducts. RCI load banks are an option to freestanding fan-cooled models, where noise levels and space are restricted.RCI load banks are used to Periodically Test & Exercise Stand-By generators or to automatically maintain loads.The RCI range of load banks are available with control options:- local control, remotely mounted control or automatic monitoring and loading. Battery discharge load banks are available in two types, DCM manually controlled by switches and DCC type which are constant current type controlled by a digital display control processor. Standard DCM units are available for telecommunication batteries in 50 volts DC, higher voltages are made to order. 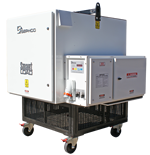 Designed for portable applications, the WAR series resistive and reactive load banks are weatherproof construction, designed for harsh and tough environments, for testing and commissioning of generators. Featuring rugged stainless steel immersion proof and vibration proof resistors, high quality class F reactors, integrated switchgear with individual load circuit breakers. Control is portable, remote data capture with touch-type Key pad and PC interface..
SEPHCO leads the way in LOAD BANK design and digital control technology. All digital controls are at the TOUCH of your fingertips. Take control with easy to use unique programs that display status, system feed-back interface, provide accurate programming and data capture. Remote control or local, available in fixed and portable applications. 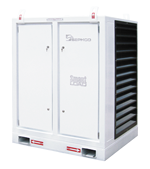 SEPHCO SmartLoad Banks are compact, weatherproof, corrosion resistant, made for continuous operation. On-going development with over 40 years of experience, go into every load bank to produce a product that exceeds customer expectations.